Over the past several years, dozens of streaming sites have sprung up to service users looking for a torrent-style fix, without having to deal with the relative complications of torrent sites. With colorful and intuitive interfaces, these streaming platforms look much more like Netflix than The Pirate Bay, while offering much of the same video content. Visitors simply find the title they like and press play, with the action taking place right inside the browser. Born just a couple of years ago, FMovies (also known as BMovies) is one such site. From a standing start the site grew exponentially, largely due to offering tens of thousands of mainstream movies and TV shows to an audience of millions, for free. This popularity caused problems, however. With copyright holders always looking to throw a wrench in the works, FMovies has been forced to skip from domain to domain, to circumvent ISP blockades in various countries and to avoid the kind of search engine downgrading that comes with having a lot of infringing content indexed by Google. Despite operating a number of ancillary domains, FMovies spent most of its time using the Tonga-based domain FMovies.to. However, sometime during the past few months the site decided to move to the Sweden-based FMovies.se but that hasn’t gone to plan. Hi folks. We've switched to https://t.co/FUn1yyZmqY again due previous registrar deactived our .se domain. Now please use https://t.co/FUn1yyZmqY for enjyoing also please help us spread this world. Thanks! 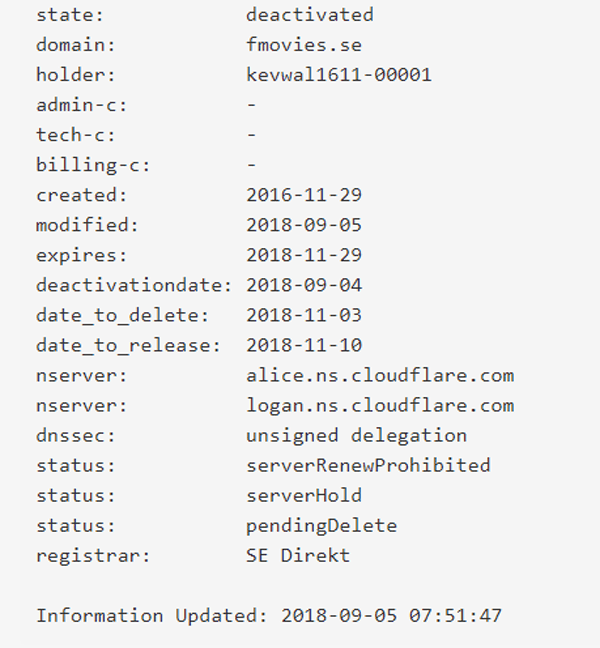 Indeed, checking the WHOIS details of FMovies.se reveals that despite an official expiry date of November 29, 2018, the domain was deactivated September 4, 2018 by Sweden-based registrar SE Direkt. 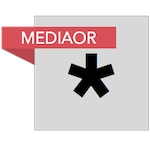 It now features the familiar ‘red flag’ warning signs of a domain in peril with serverRenewProhibited, serverHold, and pendingDelete status messages. FMovies did not immediately respond to TorrentFreak’s request for comment so it’s unclear why the site lost control of its domain. It might be logical to presume that copyright issues are at the root of the problem but it took an awfully long time for The Pirate Bay to lose control of its .SE domain in similar circumstances. That being said, FMovies is definitely on the radar of rightsholders. In the summer of 2017, the operators of FMovies were ordered to pay $210,000 in damages after losing a case filed by media conglomerate ABS-CBN in the United States. FMovies was found guilty on six counts; federal trademark infringement, false designation of origin, direct copyright infringement, contributory copyright infringement, unfair competition, and false advertising. The ruling also allowed ABS-CBN to take over the FMovies.to domain name, although that did not happen immediately. The site is also being monitored by the United States Trade Representative. Along with GoStream (Vietnam), Movie4K.tv (Russia) and PrimeWire, the site was listed in the USTR’s ‘Out-of-Cycle Review of Notorious Markets’ report back in January. But, despite the loss of its .SE domain, a pretty big court ruling against it, and the US Government sniffing around, FMovies rolls on. The site says it will now operate from the Iceland-based FMovies.is domain.